I think I've mentioned before that I moved in with C last October, since moving in I've really wanted a pet, C was as convinced but I finally persuaded him to allow me to get a rabbit on one condition. I read a book he bought me on looking after rabbits and we didn't rush into it. To be honest I'm glad he was like that as it meant we really thought things through before jumping into it. I thought I'd share a few of the tips for first getting a rabbit on here in case anyone is considering it! I'd had rabbits as a child but don't remember a lot about caring for them (pretty sure mum did that) and what they ate etc. C bought me Rabbit and Me by Emi Lau from amazon (link here) and made me read it before we got one. 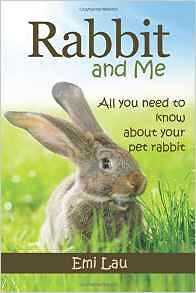 It was actually a really good book and if you're considering getting a rabbit I'd fully recommend it. It includes information on indoor and outdoor, how to get rabbits, adoption, feeding, bonding and more and has definitely helped us with them.